There’s so much going on in Roslindale, it’s a good thing we’ve got terrific local media, Facebook and other platforms to keep us on top of it all! Roslindale residents, business owners and property owners look to Roslindale Village Main Street to keep our wonderful neighborhood business district thriving. The Main Street website will keep you posted on all the great things they’re doing, as well as other community meetings, events and news. Stay up-to-the-minute with Keep Roslindale Quirky on Facebook and RISE, both hubs for under-the-radar news, networking, and community activism. The Roslindale Transcript is a great weekly newspaper available online as well. The West Roxbury – Roslindale Bulletin, a more recent weekly, is fast becoming a favorite. The print version comes out on Thursdays and it’s free! My company, Insight, reserves the back page every week to publicize our clients’ homes. Universal Hub is a Boston community news and info site with a Roslindale page, and NextDoor is a great platform to get your message out to all areas of Rozzie. Do what I often do: Stop in for lunch or a snack at Fornax Bread Bakery on Corinth Street to catch up on what’s REALLY happening in town. Or do your grocery shopping at the Village Market where you’ll run into everyone you know. One of the great things about being a Rozzident is that an errand to buy a quart of milk takes anywhere from 20 minutes to an hour and 20 minutes! A mere 6 miles from downtown Boston, Roslindale’s dining and shopping destinations will take you on a trip around the world! I’ve never eaten better in my life! Delfino Ristorante on South Street in the heart of the Village is Northern Italian cuisine at its finest. The same owners have recently opened 753 South right across the street for small plates, cocktails and espresso. Their outdoor patio seats 60+. Talk about a place to catch up on everything with everybody! Sophia’s Grotto is THE source for crisp, delicate pizza and creative Italian fare. Their stuffed artichoke hearts and whimsical cocktail creations are superb. 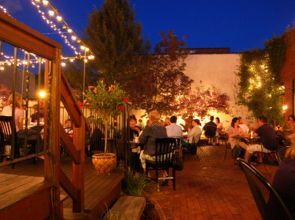 Birch Street Bistro offers elegant entrees and desserts from the four corners of the globe, and live music on Thursday nights. Shopping for yourself or for gifts? Visit Joanne Rossman, with the great tagline — “Purveyor of the unnecessary & the irresistible” – I dare you to resist her selection of impeccably curated clothing, housewares and books. Birch Street House and Garden is a beautiful treasure hunt, with a many-layered assortment of gifts, housewares, textiles, cards and seasonal lovelies. For canine and feline family members, there’s no more complete or caring boutique than The Pet Cabaret. Just outside the Village at the corner of Washington and Metropolitan. Staff will listen, suggest, and then suggest again the best items for your pets. And they have a dog-wash out back when Rover rolls over in the wrong stuff! And right across the street, one of Rozzie’s oldest(since 1888) and most accommodating businesses, Roslindale Hardware. Whether you’re looking for a $1.59 packet of washers or a sump pump, Joe Porteleki and crew will make sure you leave with the solution to your household quandaries. And Joe is also a Justice of the Peace — just saying! And, as of 2018, Rozzie now has its own mini-Target, on Washington Street just before you enter the Village, heading north! Roslindale Fish Market, for the freshest fish in Boston, plus seven varieties of Feta cheese and as many types of olives. Wonderful produce, imported olive oils and a full range of Greek groceries as well. Bob’s Pita Bakery, for fresh bread, amazing olive oil, Arabic spices and lots of fruits and veggies. The Boston Cheese Cellar — a generous slice of Paris, right in our own backyard, with hundreds of fresh, fragrant cheeses and other gourmet delights. Cold brew coffee and delicious sandwiches, too! Fornax Bread Bakery, where you can order up a hearty, from “scratch” breakfast or lunch, as well as sample true artisanal breads. Their pies, cakes, cookies and pastries are also sine qua non! Designed with retro seating and an ever-changing art exhibit, this is the place to gather. Solera, for the perfect wine to accompany it all. The resident sommeliers will guide you to the right choice! Take a gander at our group, the Roslin-Dolls, recorded at our world debut back in 2010! RIP our beloved Judie Leon, in hot pink muumuu and blonde wig. Our group has recently re-formed and we’ll be performing at the 2019 Roslindale Day Parade fundraiser in May. Don’t miss it! 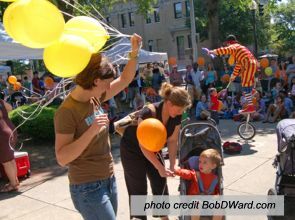 View Roslindale and over 3,000,000 other topics on Qwiki.